High Tide is a beautifully presented 2 bedroom bungalow with enclosed, lawned garden. Free Wi Fi. Off-road parking for 2 - 3 cars and outdoor seating. Well equipped kitchen. Within 10 minutes walking distance to the sea and the centre of the village. Access to good bus routes and railway station. Saundersfoot is a lovely Welsh coastal village with everything you could want including a choice of fantastic beaches, beautiful harbour, shops, restaurants and plenty of parking. It is a popular centre for sailing, fishing, water sports and traditional seaside holidays. We are Richard, Marie-Louise, George and Lily Layton and we farm in Herefordshire. We bought our first property (W523) in Saundersfoot in 2004 and we have already created many happy memories of times spent here. We hope that you leave with lovely memories of your own. The magic and charm of Pembrokeshire never ceases to delight, and we are always pleased to welcome guests back year after year. We already own a property in Saundersfoot (property ref 8102708) and decided to branch out and purchase this charming bungalow. We love the area and could think of no better place to buy! Our lovely bungalow is situated in a quiet location, but just a few minutes' walk from the centre of the bustling village. Family bathroom with walk in shower, WC and wash hand basin. Full central heating throughout the bungalow. Parking for 2 - 3 cars. Colour television with Sky TV and DVD player. Leather 2 seater and 3 seater sofas, coffee table. Dining table and chairs. Well equipped kitchen with gas cooker, fridge, freezer, washing machine, microwave. Fitted cupboards. There is a dining table to seat 4 in the dining area, plus a large table and chairs to seat 8 in the conservatory. Perfect for larger family groups to enjoy meals together! A little light reading can be found in the lounge. Thee is a small selection of DVDs available. Lawned, enclosed garden with large decked area - perfect for lazy summer evenings. Notes on accommodation: Please note that smoking is not permitted in this property. Up to two well behaved dogs welcome by prior arrangement at a cost of £20 per break per dog. Travel cot and high chair available. Outside: Enclosed lawned area, also large decked are with outdoor seating. Cleaning / Towels / Linen / Maid service: Bed linen included in rental price but not towels. Other: Beautiful garden room with dining table and comfortable seating - perfect for relaxing on a warm summer evening. Thank you for your review, we loved having you to stay too! We look forward to welcoming you back in the future. Thank you - we are pleased that you enjoyed your stay and look forward to welcoming you back in the future. Everything was perfect! All instructions of how to get there and pick up the key were provided well in advance of our stay. It was very clean and utensils and basic bits and pieces were already provided in the kitchen which made our stay a lot more comfortable. It is in a great location and a short walk down to the beach and saundersfoot. We thoroughly enjoyed our stay, thank you so much. Thank you for your lovely review. We are delighted that you enjoyed your stay and look forward to welcoming you back in the future. Lovely bungalow with everything we needed for a winter break by the sea. Had some wonderful sunny days on beach walks. The local area is amazingly beautiful. Recommend and will return. Thank you for your lovely review. We are so pleased that you enjoyed your week at High Tide and look forward to welcoming you back in the future. This was a great place to stay. It was very tidy and clean and very well equipped. The enclosed garden was great for the dogs. We are so glad that you enjoyed your stay at High Tide. Thank you for your lovely review. 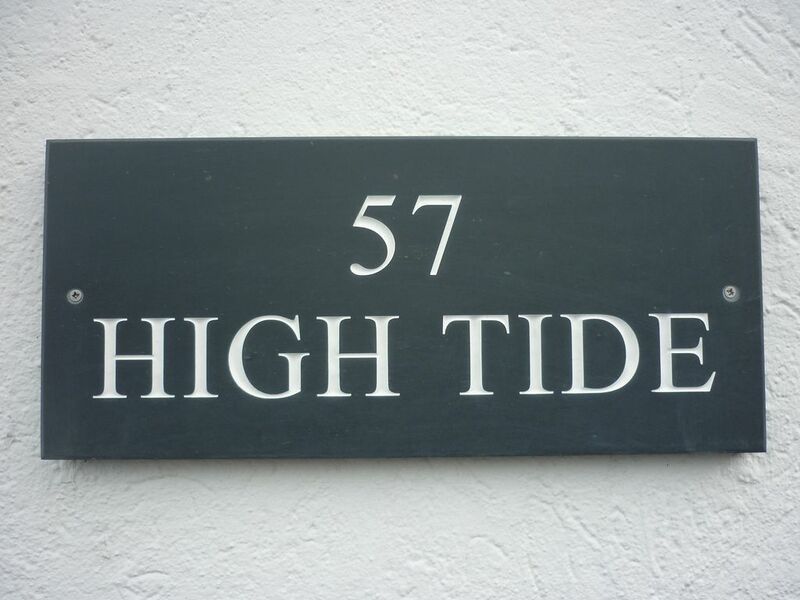 I had an amazing stay at High Tide during half term in Oct with my 2 children and dog. The bungalow has everything you could possibly need and more. You can literally walk to the town/beach in 10 minutes but the walk back is not for the faint hearted as it is a very steep hill - excellent exercise though. We hardly used the car except to meet with friends in surrounding towns. Saundersfoot is just lovely - most pubs/cafes are dog and child friendly and we were so lucky to have the most amazing weather. Recommend walking to Wisemans Bridge - such a fun walk through the old tunnels. Wouldn't hesitate to recommend this super holiday let and hope to return again soon. Ah, thank you so much. We are glad you enjoyed your stay at High Tide and look forward to welcoming you back in the future. Maximum 10 minute stroll to the beautiful beaches of Saundersfoot. Car recommended but not essential. If travelling by train it may be easier to travel to Tenby as it is much easier to order a taxi or catch a bus to Saundersfoot. Booking Notes: Please email or telephone for availability, and for booking form. A 30% deposit is required at time of booking, with balance due 6 weeks before holiday date. Holidays booked within 6 weeks of holiday date must be paid for in full at time of booking. Changeover Day: Changeover day is Saturday for full week bookings, short breaks by arrangement. The house is available from 4pm on the first day of your stay until 11am on the morning of departure. Notes on prices: Prices from £280 - £620 for full week bookings. Short breaks (min. 3 nights) available from £65 - £130 per night. No short breaks available during school summer holidays. 14th December - 5th January at £130 per night for min. 3 nights. Please note that we do not offer cancellation insurance. However, if you do find that you are unable to take the holiday that you have booked and paid for, we will be happy to transfer the payment to an alternative date wherever possible.